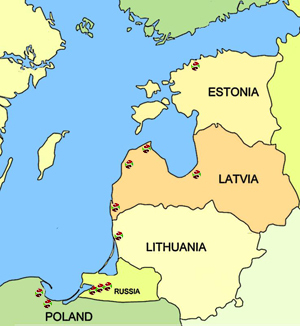 Litiksa Ltd. is a physical marine lubricant supplier at the ports of Baltic States. Our company offers a wide range of high quality oils for main engine and other subsidiary mechanisms of such brands like: Shell, Castrol, Gulf, Mobil, Lukoil, Statoil. Litiksa Ltd. sugests also motor oils for main engines of GOST standart: M14G2CS. Deliveries can be performed in bulk, in IBC containers (1000 l) or drums. We also offer pumping service ex drums and IBC containers (1000 l). Our team handling supply operations in physical ports is available 24 hours per day, 365 days per year to discuss clients' requirements of lubricants. In case of global supplying of marine lubricants our company suggest global lubricants trading service in main ports of the world. The perennial experience of collaboration with an extensive international network of partners gave us an ability to offer you branded product at competitive prices. Our staff bring the benefits of their experience and expertise to provide clients with a professional, cost-effective means of meeting their lubricants requirements on a global basis.